in some places is much rougher than the global surface average. or the Appalachians is present at the 660-km boundary," said Wu. NOTE: This graphic is not to scale. subdivided into an inner and outer core. including the transition zone within the mantle. In a study (Inferring Earth's discontinuous Chemical Layering from the 660-kilometer Boundary Topography) published this week in Science, Princeton geophysicists Jessica Irving and Wenbo Wu, in collaboration with Sidao Ni from the Institute of Geodesy and Geophysics in China, used data from an enormous earthquake in Bolivia to find mountains and other topography on the base of the transition zone, a layer 660 kilometers (410 miles) straight down that separates the upper and lower mantle. To peer deep into the Earth, scientists use the most powerful waves on the planet, which are generated by massive earthquakes. "You want a big, deep earthquake to get the whole planet to shake," said Irving, an assistant professor of geosciences. "instead of frittering away their energy in the crust, can get the whole mantle going," Irving said. She gets her best data from earthquakes that are magnitude 7.0 or higher, she said, as the shockwaves they send out in all directions can travel through the core to the other side of the planet - and back again. For this study, the key data came from waves picked up after a magnitude 8.2 earthquake - the second-largest deep earthquake ever recorded - that shook Bolivia in 1994. "Earthquakes this big don't come along very often," she said. "We're lucky now that we have so many more seismometers than we did even 20 years ago. Seismology is a different field than it was 20 years ago, between instruments and computational resources." Seismologists and data scientists use powerful computers, including Princeton's Tiger supercomputer cluster, to simulate the complicated behavior of scattering waves in the deep Earth. their ability to bend and bounce. Just as light waves can bounce (reflect) off a mirror or bend (refract) when passing through a prism, earthquake waves travel straight through homogenous rocks but reflect or refract when they encounter any boundary or roughness. "We know that almost all objects have surface roughness and therefore scatter light," said Wu, the lead author on the new paper, who just completed his geosciences Ph.D. and is now a postdoctoral researcher at the California Institute of Technology. "That's why we can see these objects - the scattering waves carry the information about the surface's roughness. In this study, we investigated scattered seismic waves traveling inside the Earth to constrain the roughness of the Earth's 660-km boundary." The researchers were surprised by just how rough that boundary is - rougher than the surface layer that we all live on. "In other words, stronger topography than the Rocky Mountains or the Appalachians is present at the 660-km boundary," said Wu. Their statistical model didn't allow for precise height determinations, but there's a chance that these mountains are bigger than anything on the surface of the Earth. The roughness wasn't equally distributed, either; just as the crust's surface has smooth ocean floors and massive mountains, the 660-km boundary has rough areas and smooth patches. The researchers also examined a layer 410 kilometers (255 miles) down, at the top of the mid-mantle "transition zone," and they did not find similar roughness. 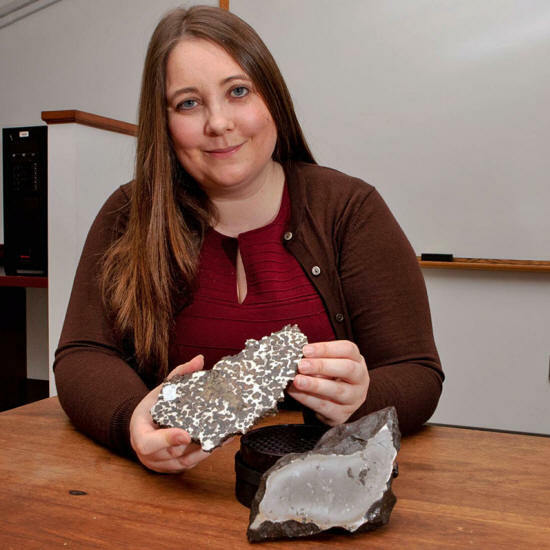 "They find that Earth's deep layers are just as complicated as what we observe at the surface," said seismologist Christine Houser, an assistant professor at the Tokyo Institute of Technology who was not involved in this research. Their findings suggest that as earthquakes occur and seismic instruments become more sophisticated and expand into new areas, we will continue to detect new small-scale signals which reveal new properties of Earth's layers." from the interiors of planetesimals. The presence of roughness on the 660-km boundary has significant implications for understanding how our planet formed and continues to function. That layer divides the mantle, which makes up about 84 percent of the Earth's volume, into its upper and lower sections. For years, geoscientists have debated just how important that boundary is. 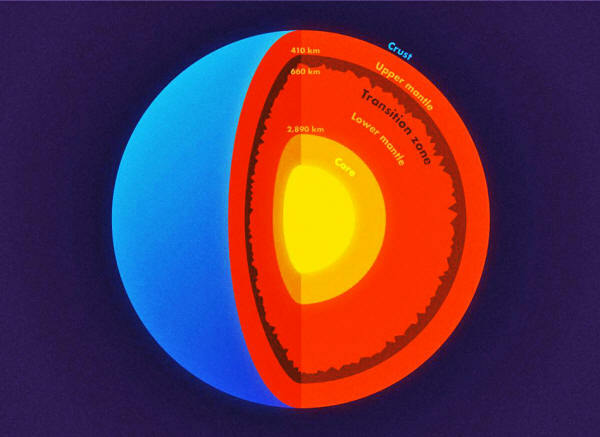 In particular, they have investigated how heat travels through the mantle - whether hot rocks are carried smoothly from the core-mantle boundary (almost 2,000 miles down) all the way up to the top of the mantle, or whether that transfer is interrupted at this layer. Some geochemical and mineralogical evidence suggests that the upper and lower mantle are chemically different, which supports the idea that the two sections don't mix thermally or physically. Other observations suggest no chemical difference between the upper and lower mantle, leading some to argue for what's called a "well-mixed mantle," with both the upper and lower mantle participating in the same heat-transfer cycle. "Our findings provide insight into this question," said Wu. Their data suggests that both groups might be partially right. The smoother areas of the 660-km boundary could result from more thorough vertical mixing, while the rougher, mountainous areas may have formed where the upper and lower mantle don't mix as well. In addition, the roughness the researchers found, which existed at large, moderate and small scales, could theoretically be caused by heat anomalies or chemical heterogeneities. But because of how heat in transported within the mantle, Wu explained, any small-scale thermal anomaly would be smoothed out within a few million years. That leaves only chemical differences to explain the small-scale roughness they found. What could cause significant chemical differences? The introduction of rocks that used to belong to the crust, now resting quietly in the mantle. Scientists have long debated the fate of the slabs of sea floor that get pushed into the mantle at subduction zones, the collisions happening found all around the Pacific Ocean and elsewhere around the world. Wu and Irving suggest that remnants of these slabs may now be just above or just below the 660-km boundary. "It's easy to assume, given we can only detect seismic waves traveling through the Earth in its current state, that seismologists can't help understand how Earth's interior has changed over the past 4.5 billion years," said Irving. "What's exciting about these results is that they give us new information to understand the fate of ancient tectonic plates which have descended into the mantle, and where ancient mantle material might still reside." "Seismology is most exciting when it lets us better understand our planet's interior in both space and time."